Support A Public Awareness Campaign for Firearm Safety! Oppose SB 17 – A License to Discriminate! Fight to protect local democracy! Make Democracy Work in Texas! LWVUS Money in Politics Action Kit provides tools for League members to take action in your community or state. 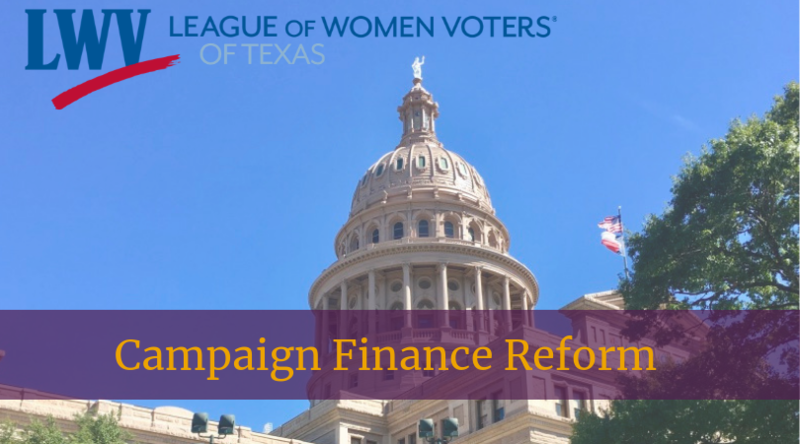 The League of Women Voters of Texas supports laws and practices relating to political campaign finance that eliminate excessive and/or inappropriate spending and promote equitable competition among candidates. © Copyright League of Women Voters of Texas. All rights reserved.